Want something that is not only simple but effective as well? Here is how you do it with 4 easy shoulder blade exercises to take you diet to the next level in fitness anywhere anytime. Is thinking that you need special equipment to exercise keeping you from being more active and focusing on yourself? When break time comes and you don't want to be stuck touching your toes. Switching up your routine every once in a while is not a bad thing. That's why in this column we are going to do just that with 4 SHOULDER-BLADE EXERCISES to get frozen shoulder relief and keep weight problems off your back. Follow me as I explain the origins of this article and how it came to be, or skip the intro getting the meat of this article. Dieting in Japan is not just about what you eat. In Japanese, the word "diet" is now used as a suffix when referring to anything used to benefit health, fitness, and beauty. What's your diet? Are you starving for something new to fight of the old 1-2 of conventional diet and exercise? Then you are in the right place, because Japan is a melting pot for diet innovation. If what you do to stay so slim is brush your teeth using a weighted toothbrush, good for you. Not only does you dental hygiene improve, you work up a sweat training those forearms that have been on your mind. The next diet that comes to the surface only requires you to exercise your scapular area, i.e. your shoulder blades. It is said that just by performing simple movements to exercise the area around your shoulder blades that you can prevent obesity that in other words may help keep your weight down to a minimum with little extra effort. If you are someone who suffers from tiredness, there is no reason you don't want to give this diet a try. When it is all said and done, what matters the most is that you CHALLENGE YOURSELF. The bright side about these exercises is that they can be done in minutes. This is perfect for busy people on the run. Just using a small portion of your time, such as in the morning or before you go to bed you can get it all done. Like any other diet, it's not a race. Go at your own pace, not worrying how fast and good looking are the other stretchers. The images you see on this page are a testament to the hard work put in by Slism staff in order to make the shoulder-blade-diet available for your viewing pleasure. If you are thinking that it's so easy that all you have to do is rotate your shoulders, then you may be a little disappointed after actually trying some of these exercises out. By combining shoulder blade exercises that you can do anywhere and anytime with fundamental core body movements to tighten down your waistline, this is an opportunity to challenge yourself. Here are the four exercises that you can use to slim down you hard to get places like your upper arms (triceps) and your core. For ladies looking for fun ways to slim down their waist, this is for you. This next exercise might require choreography. You never know, you might want to take this with you when you want to dance. 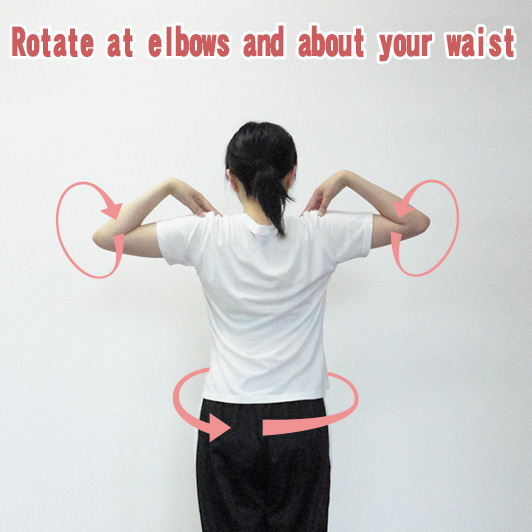 In this exercise, place your hands on your shoulders, rotating at your waist and elbows, as shown in the following picture. Because these movements are so fundamental, this is an exercise than anyone should be able to do. 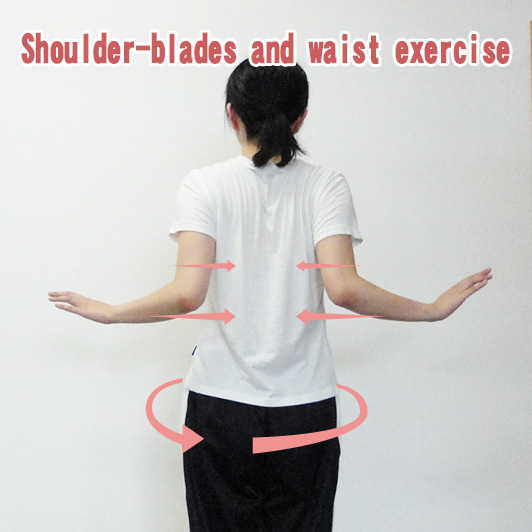 By performing this exercise you will feel the muscles around your shoulder blades being work. For even better results, tighten the muscles around your waist while doing the exercise. This next exercise targets the area under your arms, a very hard place to get to at times. So flex you muscles, it's time that you learn how to scratch your back. 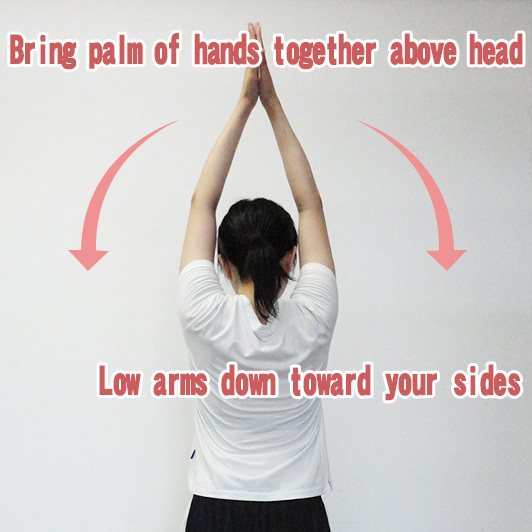 Spreading legs shoulder widths apart, bring hands together above your head breathing out. Extend your arms out above you stretching the muscles in your shoulders. 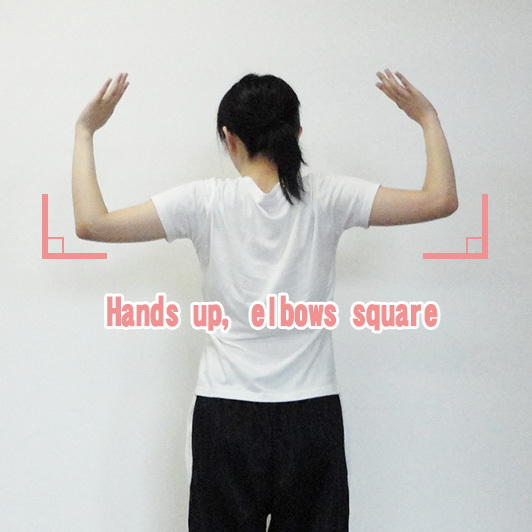 Palm facing away from body, bending slightly at the elbows, bring arms back rotating shoulder blades inwards. Exhale as you bring your arms down. 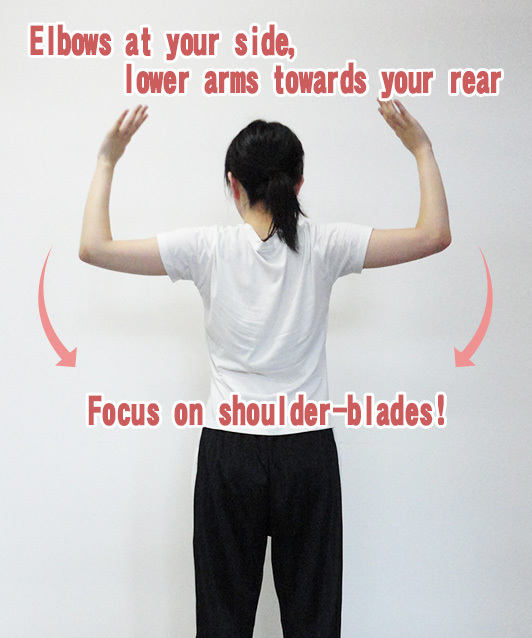 Focus on motion around upper arms and armpits. Open up your arms, bringing your elbows in toward you back. You will notice a sensation in the muscles in your back. There is no need to overexert yourself when doing this exercise, just go with whatever feels right. When you feel your stretching could use a little more hip-hop to it, do this next exercise. This next exercise is going to loosen up the joints around your shoulders. Hands in the air with elbows bent so to form a 90 degree angle in your arms. Hold it right there. Next, take your arms and flap them down as if you were trying to drive your body upward using air in the room. When you complete this action, you will start to notice knots removed from your shoulder-blade area. 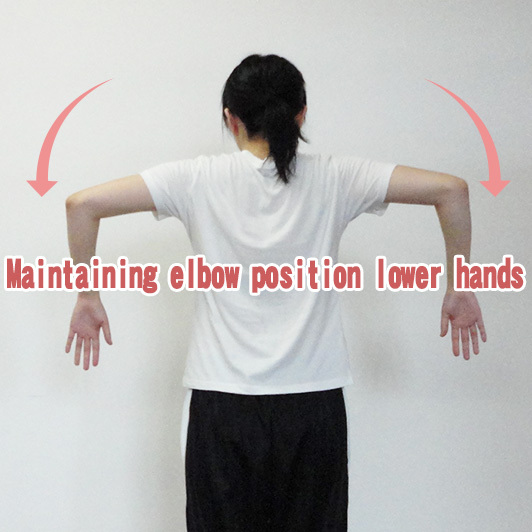 Be sure to maintain a proper bending angle in your elbows when carrying out this exercise. This exercise is especially effecting in toning your triceps as well as losing up the muscles in your shoulder-blades. When you want to entertain your kids, do this next exercise. Not only will your kids think it's funny, you will have less knots in your back. Hands palm out, bring elbows in towards the center of your body. Doing this while twisting at your waist is a sure way to slim down your mid-section. It may look funny at first, but the longer you do it, you will realize how hard it really is. On the bright side, beyond the boost in humility you get from it, it does wonders to slim down your waist. Asking questions in life will take you far and possibly inspire others to follow in your tracks, coming full circle with the qualities that make us human. Here are two ways to get the most out of exercises describe in this article. No exercise or diet return is a one shot wonder. That is to say, don't expect miracles when you have yet to put in the time to allow your body to adjust to the good that you are putting into it. The little effort you put in each day helps to build subconscious triggers in your day to keep you going the right things without thinking. When results start showing, you may feel content with the medals you just won and feel like you just caught some wind; but don't let that stop you from doing the little things you do to stay healthy and keep your weight down. Dieting and exercise is not like playing dominos, where you somehow safely manage to line up all begs only to have them knocked down in the end. Think of your diet as a pyramid, something that lasts with the ability to reach the admiration of others. Breathing like the rhythmic beating of your heart controls how well your body can function. Deep breaths can take things off your mind that would otherwise remain trapped in a worrisome prism. Controlled breathing helps calm your body, just what you need when exercising – peace of mind to get through hard times. There are many reasons such as stiff shoulder, chills, and your menstrual cycle that affect you mood from day to day. Doing shoulder exercises helps promote good blood circulation, which could help balance out the way you feel at times. There isn't one lady that wouldn't like to know how to better protect their chest and age more beautifully. Don't let time tell your body what it has to look like. Women across the world are taking the fight to gravity doing these exercises. By doing these simple shoulder blade exercises, there is no reason to wait until the next year till you start seeing results. Many who have done these exercises have said that only after 3 months that they've started to see definite differences. 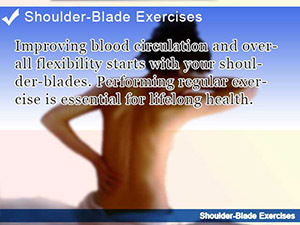 Improving blood circulation and overall flexibility starts with your shoulder-blades. Performing regular exercise is essential for lifelong health. When you sleep your back gets twisted out of proportion. Coping with these problems by stretching first thing in the morning is a good way to fight off back pain. 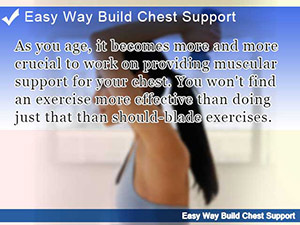 As you age, it becomes more and more crucial to work on providing muscular support for your chest. You won't find an exercise more effective than doing just that than should-blade exercises.